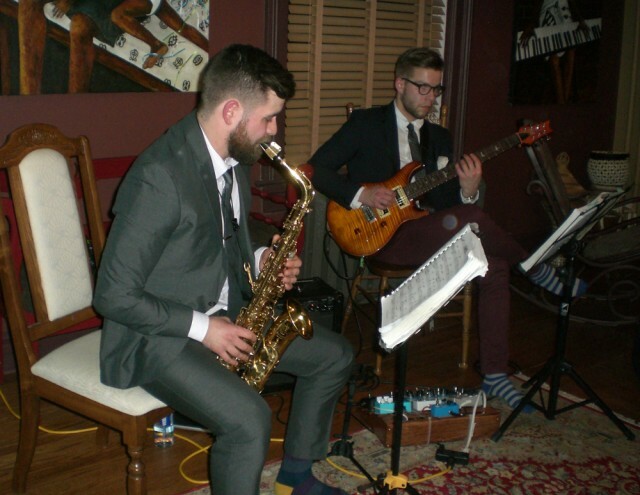 BU musicians Teegan Walker (saxophonist) and Scott Brown (guitarist) entertained guests at the annual President's Circle Holiday Reception on Thursday evening, Dec. 10, 2015. More than 100 people attended this year’s President’s Circle Holiday Reception on Thursday evening, an excellent turnout for the annual event. 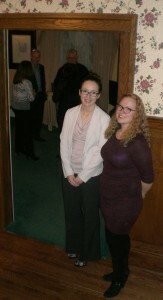 BU Student Ambassadors Bailey Kacsmar and Sarah Wallace greeted guests and helped take their coats at the annual President’s Circle Holiday Reception on Thursday evening, Dec. 10, 2015. Hosted at his home by Brandon University President Gervan Fearon, guests were treated to an evening of mingling and cheer, with live music provided by students from the BU School of Music. The Brandon University Foundation President’s Circle recognizes donors whose annual contributions of $1,000 or more help support fundamental areas such as faculty and student research, scholarship and bursaries, library acquisitions, campus infrastructure requirements, or more general needs within a donor’s preferred faculty or department of choice.